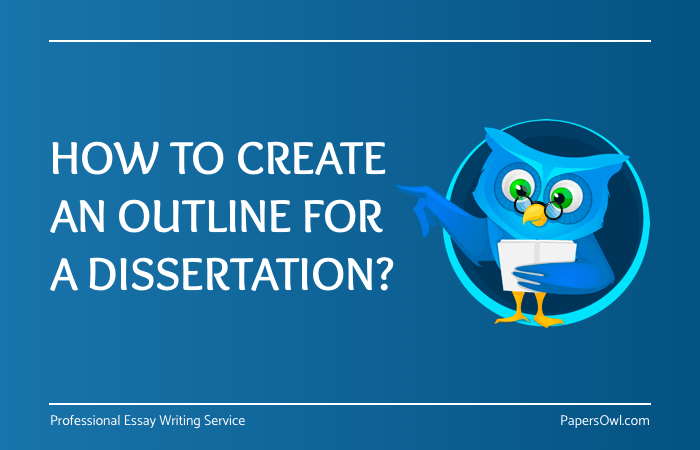 How To Create An Outline For A Dissertation? For many years essay writing for college and all similar types of written academic assignments have been the biggest headache and problem of all students. Such written tasks have always been and will remain an integral part of any educational program because completing those helps a student not only obtain an important set of skills but also ensures success for a future career. This type of tasks influences students’ success in their education. Writing a simple essay or even a research paper is not that difficult compared to working on such a serious project as a Master thesis or a PhD dissertation. These are the tasks of the highest importance. Your future mainly depends on how well you handle it! Due to these reasons, we bet, that your main goal is to create a top-notch dissertation that would make you a successful specialist in your field with a Doctoral degree. How can you do it? You will be surprised, but the key to success is a dissertation outline! For most students, a dissertation paper is arguably the most demanding paper to write in college or university. Therefore, learning how to write an outline for a dissertation is a necessary evil. With correct formatting, you can organize information for a Ph.D. paper properly. A research outline gives you a clear overview of what you should do in every paragraph and chapter throughout a write-up. It is easy to track your progress without repeating points. No important point would be left out during writing. Writing a dissertation outline with well-arranged points simplifies your craft. It gives students an assurance of scholastic academic paper writing since they can easily connect ideas to a thesis statement. Now, assuming you already a few ideas for dissertation topics, it is time every student out there learned how to do a dissertation online the right way. When it comes to using a formal writing format for your dissertation paper, it is imperative that one pays attention to a few details. Thus, having a good plan to get you started is vital. Therefore, start by taking note of the main sections of a dissertation paper and everything in between. If you choose to hire professional dissertation writers for your project, confirm if he or she should be able to do the right thing, and comprehensively. A topic makes it easy for a student to break down the first section of a dissertation write-up into vital parts. You will be able to think about a good title, formulate a proper abstract and even prepare a table of contents. But first, make sure to do your research well, and even try out a few topic prompts before consulting your supervisor for approval or advice on areas that require improvement. Depending on your methodology, go right ahead and gather data and information. You may want to use interviews, questionnaires or observation, but the most important bit is making sure that everything relevant to the topic. With it taken care of, proceed to note down main points. From the front page, introduction, literature review, research methodology, research findings/results, a list of cited works/references to appendices, every detail plays significance toward crafting a structure for a dissertation paper. You can always get a dissertation outline example from your supervisor for and learn a few tips here and there. Given that a structure is synonymous of an outline, your main ideas and supporting arguments should serve as a writing guide. Next, create a comprehensive draft for the introduction, chapters, and conclusion. Do not forget that supporting details should reinforce your thesis statement. But if you are not able to craft a good outline, you can always contact one of the dissertation writing services online for help. You will learn a lot, especially how to write a dissertation outline. Why do you need to look for dissertation outline examples? Although making a plan is not that difficult, having a good dissertation outline example in front of your eyes is a good thing as it will make everything easier and give you a clear understanding of what you need to do. Below is an example that you can follow. Writing a simple essay or even a research paper is not that difficult compared to working on such a serious project as a Master thesis or a Ph.D. dissertation. These are the tasks of the highest importance. Your future mainly depends on how well you handle it! Due to these reasons, we bet, that your main goal is to create a top-notch dissertation that would make you a successful specialist in your field with a Doctoral degree. How can you do it? You will be surprised, but the key to success is a dissertation outline! Students often overlook the necessity to prepare a detailed outline for a dissertation (unless their professor had asked them to do this) but you can’t imagine how helpful it can be for you! In fact, you should not neglect the importance of it because writing a step-by-step plan will help you create your dissertation chapters faster and easier, follow a clear structure, not forget to write down some important details, etc. An outline can be helpful in many ways! It saves you lots of time, making the writing process simpler. In summary, quality academic write-ups are premised on proper planning and detailed outlines. Together with the advice of your project supervisor and our expert writers at PapersOwl that will always make your writing easy, any student can get the best grades.